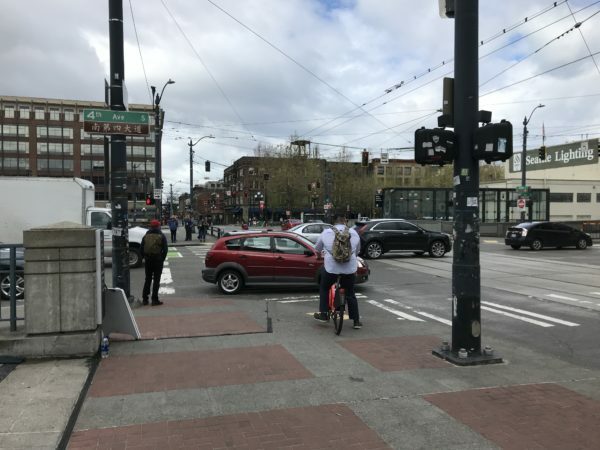 With tens of thousands of cars, trucks, and buses driving through the intersection—4th Avenue South is the busiest south portal into Downtown, apart from I-5—at high speeds, crossing the street can feel a lot like Frogger. According to SDOT data, 90 different collisions have occurred at the intersection since 2004, causing 51 injuries. Yet it’s also one of the most important transit rider and pedestrian centers in Seattle. In the coming decades, a new light rail station on 4th or 5th Avenue South will further increase the amount of people walking through the area. The importance of the hub to transit riders is most obvious at peak hours. That’s when the intersection and a crosswalk halfway down the block to its south are overwhelmed by crush loads of Sounder commuters. In that block 48 collisions caused 31 injuries since 2004. A new plan, which names the area Jackson Hub, will make the intersection safer. It could also transform the area into an iconic entrance to the city, the kind of place that will attract friends meeting over coffee, or appear in family photos and travelers’ selfies. That vision, which Chinatown-International District (CID) and Pioneer Square leaders developed with regional transportation agencies, is still years away. Megaprojects like the new waterfront plan and ST3 will require heavy equipment, debris hauling, and transforming the Hub itself. Those projects are funded from the One Center City near term action plan, and are in various states of progress. Residents Pioneer Square and the ID, the neighborhoods surrounding the station, worked with the City and government agencies to develop the plan. The Jackson Hub document ranks prosaic, day-to-day concerns like pedestrian safety as residents’ top priorities. Ryan added that, without safety improvements, the ID’s senior residents wouldn’t feel safe walking to the new waterfront, which is meant to transform life in downtown neighborhoods. The more ambitions parts of the Jackson Hub plan could, in their own way, transform the ID and Pioneer Square on a smaller scale. As with the waterfront, the long-range parts of the plan call for reclaiming living space from overscale transportation infrastructure. The plan recommends lidding the BNSF mainline, and turning the resulting open space into a park or plaza, and turning part of the existing plaza north of King Street Station into a restaurant or beer garden. The idea is to create a public gathering place where residents will want to spend time, and create a natural, walkable flow through the Hub between the new waterfront, Hing Hay Park, and Occidental Square. ID and Pioneer Square leaders hope to program the reclaimed public space in the same way that they recently revitalized the historic places. But that will require time and money. The big ticket items like the lid, beer garden, and a weatherproofing, super-tall pergola over the existing ID light rail station, aren’t funded yet. “Our next step is to sit back down and see what [funding] there is available right now and what might be available further out,” says Lisa Howard, director of the Alliance for Pioneer Square. Howard says that one reason the neighborhood groups sought out participation from the City, King County, and Sound Transit was to help build momentum for funding. Howard thinks that, in order to fully fund the project, more than one entity will have to kick in funds. According to Howard, the plan’s authors sent copies to the Seattle City and King County Councils, plus with Mayor Jenny Durkan and County Executive Dow Constantine. “We don’t have a single point of contact championing it yet,” Howard says about the elected officials, but she expects that one or some of them eventually will. The plan is especially important in the context of Sound Transit 3. 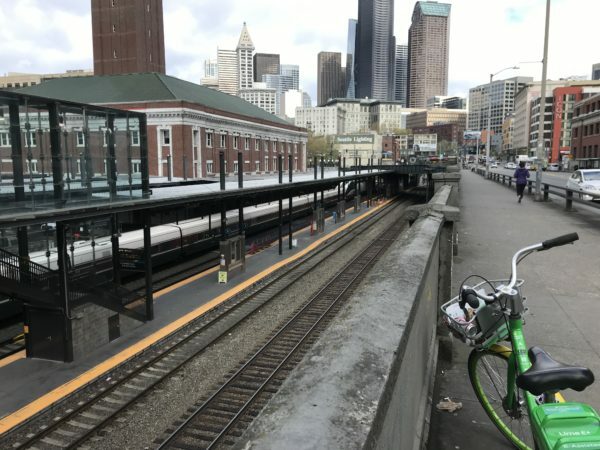 Sound Transit and the ID community have struggled to agree on a plan for the new Link station that will be built as part of the Ballard and West Seattle extensions. Some of the same ID leaders—plus Pioneer Square groups, and the Downtown Seattle Association—who have objected to current ST3 plans helped create the Jackson Hub plan. That coalition led community outreach efforts, including concept work and surveys, that went into the plan. “I think we see that long-term vision as part of the West Seattle-Ballard effort. We’re also taking it and going, what are some of these lower-hanging, near-term things that we could potentially get done that show that we’re serious about listening to the community?” says Wesley King, Sound Transit’s central corridor operations head. 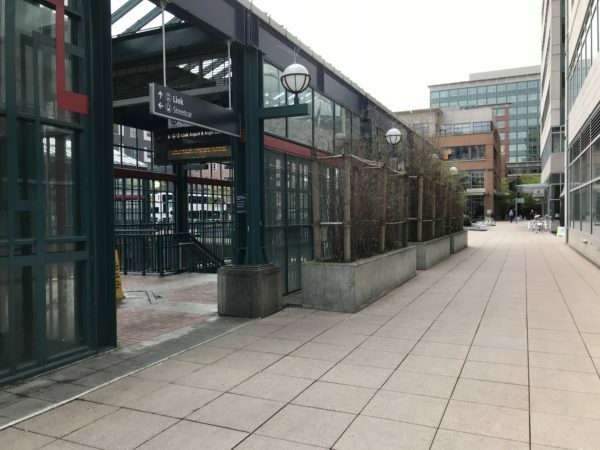 The agency will soon get to work on sprucing up the plaza above the current ID light rail station, once the agency takes full ownership of the downtown subway tunnel from Metro. Agency officials also hope that Vulcan, which controls the bulk of the plaza through an easement, will take on some of the cost and responsibility for making pedestrian-friendly changes—which the daily rush of Sounder commuters will surely appreciate. The small things that King referred to—chores like clearing dead plants and unwashed pavement—clearly don’t have the same effect as a transformative infrastructure project. But to riders who go through the same space every day, they can make all the difference in the world. That’s the best quality of the Jackson Hub plan. It poses the possibility of a transformative, iconic project that could inspire pride from every Seattleite who takes a visiting relative or colleague through it. But in the meantime, you’ll be able to cross the street to your bus safer and easier. Whenever you hear the word iconic, run. The first thing Pioneer Square should do is tear down those “iconic” Vulcan buildings with diagonal walls. I don’t want an iconic architect’s statement, I want a revival of the City Beautiful movement, the same movement that inspired King Street Station and Union Station’s design. Something friendly and intimiate with attention to detail, not a windswept geometric slab in an “innovative” shape that’s designed to be aww-ed at from a fast-moving car rather than relating to the pedestrians on the sidewalk. This plan seems to focus mostly on sidewalks and street furniture and walkability rather than buildings, so it wiill probably have less impact either way. Still, I don’t expect it to be as inviting as the plazas in Italy or Denmark, so i doubt people from those countries will be taking pictures of it or Americans will have less interest in visiting those countries. That should be the goal, really, a place that people want to linger in. The city has done good things, like the design of Cal Anderson Park. But it has also done bad things, like the design of Lake Union Park, Northgate Park, Freeway Park, etc. Hopefully this will be one of the better ones. Which Vulcan buildings do you object to? What’s wrong with Lake Union park? what’s wrong with freeway park?! i live closest to cal anderson, and it’s among my least favorite parks. freeway park has way more interesting niches. Freeway Park has always felt to me like one of the amenities that is required to build something (presumably the convention center in this case) that the is open to the public, but which the public barely uses. Cal Anderson Park, OTOH, seems awesome. Ultimate Frisbee, bike polo, grassy fields to lounge upon. I don’t get Cal Anderson Park hate at all. I also like SLU Park, assuming that means the park where MOHAI is. Except for that worthless pedestrian bridge. The ones with diagonal walls on the Union Station plaza that look like the wall is falling off. Freeway Park is a modernist design with too much concrete and benches that look like they were designed by giants: they’re too far away from neighboring benches to talk face-to-face, and they don’t have backs which makes them less comfortable to sit on. Yes, it’s nice to walk through the path and see trees and a waterfall (which is never on nowadays) and have a grade-separated path between the Convention Center and 6th & Seneca and the surrounding buildings. But it’s designed in a way that’s more for architects to look at than for people to feel cozy in. Can you imagine people in Rome and Florence flocking to it when they have so much better piazzas? Why don’t we have piazzas like they do? Freeway park was built at least 10-15 years before the Convention Center. The Convention Center added to it. I remember it being a lot smaller as a child. The lid over I-5 was also much smaller. I was told it was to connect neighborhoods dissected by the freeway built in ’62. It also represented, to some people like my hippy godfather, as early protests to freeway expansion. If it wasn’t there, that part of the freeway would be much wider. Whether it is ugly or beautiful is all up to the individual. Freeway Park is great from the perspective of a deaf person, not so great for everybody else. At the time it was built, they just didn’t understand accoustics very well, or just didn’t care. All that traffic noise just bounces off the concrete, right into the park. Lake Union Park? Where the paths seems to have been delineated by giving a chimp a bottle of gin and then paving behind him wherever he happened to stumble around, leading to a path system that makes no sense? The bridge is nice, as it gets you away from the busy Valley and Westlake arterials, provided you can zig zag your way over to it along the confusing paths. I use freeway park frequently as a way to get somewhere, and while it’s a terrible park, I like it because it often a very convenient way for me to get from Westlake to First Hill. OTOH, for Lake Union Park, I’ve never used it as a walking corridor, I’ve only use it as a destination itself and quite like it. So I like both parks, but for very different reasons. Lake Union Park has a lot of empty lawn and gravel with footpaths through the middle like the dead area around a freeway exit with just grass and roads. Nobody hangs out in the middle of these areas or plays catch with their dog there, unlike Cal Anderson Park. The only time I’ve found Lake Union Park inviting is at the 4th of July or New Year’s when there are so many people you can’t see the dead space. Well-designed places are broken up into small niches where you can stand or sit near the edges and not be overwhelmed by a huge open space to the next edge. You can do this with plants, hedges, furniture, art, and other ways. Some plain lawns are useful so people can lie on the grass or play catch with their dog, but too much grass is a monoculture that’s like a desert to little creatures, and paths through the middle of it, while sometimes useful to crossing the space, are not a substitute for inviting niche-like spaces. It’s the park equivalent of the dead “open space” around houses that’s rarely used. I don’t remember a smaller Freeway Park but I was a kid then. Yes, most of Freeway Park has the right-sized niches. I may have overgeneralized about the park. The stairs from the First Hill side, the path under 8th avenue, the waterfall labyrinth and seating platforms, the lawn at the bottom, all those are the right size. My complaint there is just the amount of concrete and its semi-Brutalist design. The part that irritates me most is the plaza near the Convention Center: a large concrete space surrounded by benches for giants. I see a commonality between those and the concrete slabs in the labyrinth. It’s understandable in the sense that this was fashionable in the 1970s and it is “freeway” park, which might imply it should be concrete-based like a freeeway. My concern is that we should not make the same mistakes in things we build now. That requires understanding what’s wrong with them and why. The problems ultimately come down to making something that looks neat and tidy on an architect’s drawing rather than asking what a park patron would want. I used to live by lake union park and quite liked it. Lake union park is more about the water. It has a beach for people to hang out on, docks, and a great swimming area. There is bridge to jump off of into the water. There are also sprinklers for kids to to run through. Additionally, there are outdoor movie showings, the center for wooden boats, and MOHAI. I’d say it’s one of the nicer parks. Cal Anderson is popular because it’s in the middle of capital hill, but Lake Union Park has way more amenities. Cal anderson just has some sports fields. Of course I swim and kayak, but I don’t do bicycle polo or play soccer, so maybe I’m biased . This area is certainly a challenge to rethink. To me, the core problem is crossing 2nd/4th at Jackson. There are a number of lanes that a pedestrian must cross all at once. 1. Put separation between Second and Fourth, building an extended Second to run further over the tracks. Imagine crossing two different one-way streets. That may end up restricting left turns from Second and Fourth. It looks however that a pedestrian would still have quite a wait after crossing one of the two streets, and this solution would be quite expensive. 2. Establish a pedestrian access that doesn’t require crossing streets. With tracks right under this problem intersection, the only way to make that happen is to add a deep pedestrian tunnel, elevate the entire street network 15 feet and leave pedestrians at the surface, or to put in a pedestrian skywalk — which would look rather inappropriate. 3. 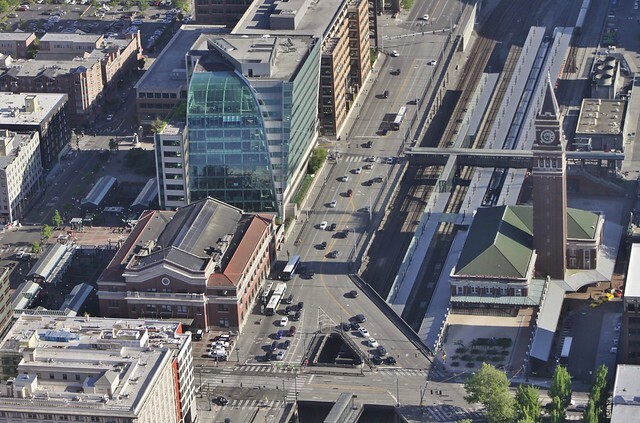 Move — yes move — the Union Station building to rest atop the current Link Station. What would that do? It would open up the current station pad for the two near light rail platforms with a plaza on top. It might enable the Fourth Avenue Link station alternatives to be shifted slightly east (pleasing the ID by not ripping up Fifth), and not disrupting the viaducts or existing tracks on Fourth. The building could be carved in segments and relocated in pieces, or maybe a large steel platform could be inserted underneath and the whole structure slowly moved. Before dismissing the idea because of how expensive and wild this option is, consider the hundreds of millions we are spending in alternatives just so we don’t touch the station building. There is precedent allowing registered historic buildings to be moved. Certainly, a refresh is needed and this effort is a great start! Still, unless the pedestrian crossing wait is resolved with a very costly solution, it’s going to merely be cosmetic. 1 & 3 seem very expensive. Doesn’t the Weller Street bridge accomplish most of #2? Regarding #3 above, I believe moving the structure, while certainly relatively expensive, can be accomplished. I saw this sort of undertaking occur in Toronto with a hotel I had stayed at before, the iconic Selby Hotel on Sherbourne St (just north of the Cabbagetown district). They moved the entire ca. 1884 brick structure forward closer to the street to accommodate building a highrise apartment/condominium project in the rear of the lot where an addition to the original structure (the Charles Gooderham Mansion) had stood and was demolished. Fwiw….this site has some cool pictures and a decent recap of the history of that property and the recent project. Anyway, your idea #3 does seem feasible (with the caveat that admittedly I don’t know what all sits underneath the station structure that may preclude relocating it). It certainly could be an option to study. They can change the signal timing this afternoon. It’s clearly not acceptable, if not technically ADA non compliant. Many of the comments are now talking about park quality, which is fine. Seattle has enough parks to go to. Every style to fit every character. Cement, forest, beach, grass fields, even for dogs. What we need is safer ways to get to and from them without a car. This is off topic a little but does make some sense here. ID and King Street station are major transfer hubs. Once you get to the street to go to the shops or parks you have this 100 year old engineering flaw turned into a 2, 3, 4, or 5 way intersection. (Depending how you look at it). I am not exactly sure how to fix it, but I would love some improvements. Second Avenue South is to the west; the arterial under discussion is 2nd Avenue Extension South. The demolition on 5th Avenue South is the station from the George Benson Waterfront Streetcar. It was shut down by Seattle and SAM when its maintenance facility was sacrificed for the Sculpture Park. Perhaps the agencies could also take out the platform and tracks on South Main Street. The term trolley may confuse. Unfunded visions will not improve the situation much. At least ST and Vulcan have funds. This is why I support the under 4th alignment for DSTT2. 4th-2nd and Jackson is a mess. While it would be expensive and annoy traffic, we can improve 5th-2nd pedestrian access, combine multimodal mass transit below street level, and improve the street level all in one blow. An expensive blow. But a blow a lot cheaper and less impactful if it is done all at once. The lid as it is is simply poorly designed. It is only a matter of time before it needs a complete overhaul. So let’s measure twice and cut through three tatami at once. There’s a BIG problem getting a tunnel west of the existing platform underneath the DSTT. Either the platform(s) have/has to be two levels under the surface (e.g. platform level in IDS 1) in order to under-run the DSTT or it has to dive steeply just north of the station. I don’t want DSTT2 to be significantly lower than DSTT1. That would destroy the whole point. I want DSTT2 between DSTT1 and the Amtrak station in location and elevation. That way the transit pedestrian traffic avoids ever going above ground. Close to Sounder too. That’s the whole point of putting it under 4th, not 5th. A Joy – The issue Tom is pointing out is how do you route the new tunnel north from a station near 4th & Jackson? The plan for the next stop to be at 5th & Madison, if not further east. So that means you have to cross the existing tunnel somehow. Your choices are above, below, or through. Through means a level crossing which adds operational complexity. Above probably puts it too close to the surface. So that only leaves below, probably somewhere in the vicinity of 4th & Washington (less than 1/4 mile from the proposed station). Or maybe you re-route the existing tunnel into the new station and make the existing station serve the new tunnel? Goonda, above DEFINITELY puts it too close to surface. It actually puts it ON the surface, since the platforms are right next to the “parking level” of the Union Station building. But this is an interesting proposal. I believe Sound Transit owns Union Station. If the Jackson Street floor became a widened Mezzanine you could actually put the tracks in the station’s parking and you would not have to tear down Fourth Avenue!!!!! The fly in the ointment is that I don’t know if the wiggle that the tracks make south of the IDS platforms is enough to re-direct the Red and Blue Line trains to the new platforms under the station. I expect it is, but am not confident. With some reasonable curvature one could swing tracks under the station building over to the trench next to Fifth; it’s only 50 feet. Of course you’d have to swing the track from the existing platform east as well, but I expect both track pairs could fit nicely together under Jackson as they both swing east. You know, this may be the answer to IDS costs and disturbances for which people have been searching. One thing it would mean is that Fifth Avenue north of Washington Street would have to be excavated, at least far enough for the Green Line trackway to get deep enough for TBM use. But that’s NORTH of Jackson and the street rises at a good grade; the excavation would be no more than two blocks and it would certainly fit within the roadway. The more I think about this the better I like it. Thank you for the excellent idea! Further investigation reveals that the Union Station Parking Garage extends under the north Vulcan Building. I don’t know how the access ramps are laid out, but it’s almost certain that the eastern half of the “ground level” of the garage would have to be taken for the train. And of course garages are not NEARLY as high as an LR train, so it would take two levels. That said, taking sixty to eighty parking slots to avoid excavating Fifth Avenue south of Jackson AND avoiding teardown of the Fourth Avenue Viaduct is a VERY small price to pay! That’s an interesting tradeoff. We’ve seen that twenty thousand train riders are often lower priority than than a hundred people in surrounding businesses and houses (A<B). Because temporary construction disruption is a big problem, while long walking distances for passengers for a hundred years is no big deal. And we've seen they're lower priority than a few hundred P&R spaces (A<C). Because how can people ride the train if they can't find parking there? But would fifty parking spaces be lower priority than a hundred business owners and staff at risk of temporary disruption (C<B)? Probably, because of equality issues for the businesses, compared to parkers at Union Station being well-off (or how can they afford driving and parking at the lot that has the best transit access in the state)? Oh, for those who think ST board members drive to board meetings. (Although we know Joni Earl took Sounder, and those stationed downtown probably take Link.) If the Union Station garage must lose a handful of parking spaces, the boardmembers who drive could pledge not to drive to Union Station any more, and let other people use the remaining parking spaces. How about this: get rid of the diagonal section of 2nd Ave south of Main and convert that space to plaza space. Make cars take a left turn onto main and then a right onto 4th. Drivers will survive. Your suggestion about getting rid of the diagonal section of 2nd Ave would create a multitude of problems for buses and cars. Main street is only one lane as both the right and left lanes are used for the terminals for routes 70 and E. Then on 4th Ave you have the transit island on the left curb so with your suggestion you would have cars and buses to the east of the island and that could be dangerous situation. You would have several routes that would need to make a left turn to go east on Jackson. So there would be delays for buses both going east and south. You would also take away a lane for traffic going NB on the 4th Ave including many Metro and Sound Transit routes. Also buses making the right from Jackson to NB need the room to make that turn and taking away a lane would make that turn a lot more difficult. Your suggestion may sound good on paper but in reality it would create delays for buses going south on 2nd Ave by forcing them to make that left turn onto Main and then a right turn to 4th Ave.
Now someone will say that buses should continue south on the 2nd Ave Extension but by doing that you take the plaza suggestion. . It would be nice to come up with a way for Amtrak thruway buses to be able to extract themselves from King Street Station than the current situation. Option 1: Connect 3rd Avenue S under Jackson Street. Buses approach from the north, go down the newly-ramped 3rd Avenue S, arrive at the station. After loading, buses turn right onto King Street and make their way to the world. Problem: Bus doors will be on the wrong side for easy loading. Problem: Expensive. Option 2: Buses come south down 2nd Avenue S, continue past King Street on Stadium Place S, turn east around the south end of the new hotel, turn north onto (what would be) 3rd Avenue S, stop and load alongside a new platform south of the station which the passengers access via the currently-unused Gate 8. After loading, buses go north, turn left onto King Street, and make their way to the world. Problem: Could be an issue with buses interacting with pedestrians coming down the west end of the S Weller Street footbridge. Either is better than the current situation of buses making an 8 point U turn while backing repeatedly into passengers, taxis and whatever else is along the platform. I would at least like to see improvements to the 4th and Jackson Island station. It could be widened by 2-3 ft to the east and still be on that same platform. Maybe put a barrier on the east side of the sidewalk that is across from the island. I am talking about the sidewalk west of the island but east of the BNSF tracks. Many people run in front of the busses after looking at the trains below. They need to go to the north or south side to cross, not in the middle. It is too dangerous for them and bus drivers. Then add that stop to the list for all door boarding. It needs it. My spelling mistakes were corrected on the comment at 5:04pm. Thank you. Did not know of the new service. Re: Goonda (why do reply options randomly disappear?). Disruption of DSTT1 to build DSTT2 is inevitable. ST3 calls for breaking the transit spine downtown. UW to RB will be a two seat ride at that point. Reroutes are already in the plan. That’s actually the beauty of doing this all in one go. Every transportation hassle it creates will have to be resolved within 20 years of DSTT2 being built anyways. These issues are inevitable. Dealing with them is our destiny. The massive unilateral overhaul is the most logical option. According to Wikiedia, Freeway Park was enlarged by about 40% with the opening of the Washington State Convention Center in 1988. I am not sure 40% is accurate. I thought it was not that much. When I arrived in Seattle in the late 80s, the bus tunnel project and the state convention project were both underway, so I can’t speak to the size of Freeway Park prior to its expansion since I never saw it in its prior state. My brother did live here then and I sort of recall him telling me about the I5 lid for the convention center and the Freeway Park endeavor doubling the size of the park. So the 40% figure may indeed be accurate, particularly when one considers the steps connecting the park to First Hill. 40% seems right to me. Mind you, I have probably the best view of it of anyone, since my office literally looks down from the top of One Union Square onto it. All the part that fronts on the Convention Center was added when they built the first phase of the Convention Center.